Ever noticed a band around some of your composting worms? This band shows that the worm is mature enough to reproduce. How do composting worms make babies? How long does it to make worm babies? And how can you encourage the worms to breed? 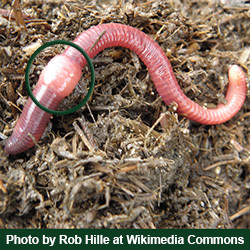 The red worm, Eisenia fetida, is a champion composting worm. 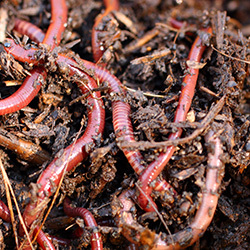 Nestled in the confines of a composting bin, red worms happily eat your kitchen scraps. In return for these tasty morsels, they excrete valuable compost. The resulting “black gold” is the best compost for your garden and indoor plants. On the one hand, red worms have both male and female characteristics. Botanists call them “hermaphrodites”. On the other hand, they need a partner to make babies. They cannot reproduce all on their own. Having DNA from two parents helps keep the offspring strong. When the conditions are right, two red worms line up against each other, facing opposite directions. Their bands, called clitellum, secrete a mucus film that envelops both worms. Each worm receives sperm, which they store for later. After several hours, the worms go their separate ways. The clitellum then secretes albumin, a chemical that makes the clitellum start to harden. The worm starts to wriggle out of the clitellum. 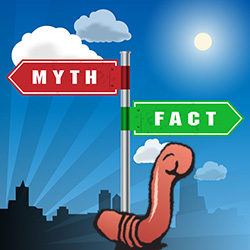 On the way, the worm deposits its own eggs and its partner’s sperm in the clitellum. The resulting lemon-shaped sac is called a cocoon. Sperm from one mating session can fertilize several cocoons. Cocoons have a hard shell that protects the eggs and developing worm babies. About the size of a grain of rice, the cocoons start out a luminescent white color. As they mature, they gradually darken, turning yellow and then brown. When they become a reddish color, they are ready to hatch. The cocoon can bide its time until conditions are right for hatching. Under ideal conditions, the worms will hatch in about three weeks. The eggs remain viable for up to one year. They can survive the cold winter and wait to hatch in the spring. Cocoons are most likely to hatch in warmer weather. A cocoon starts with up to 10 eggs, but only 2 to 6 worms will eventually emerge. Hatchlings are tiny, less than an inch long. They soon grow into full-sized worms, depending on environmental conditions. For example, sufficient food, comfortable temperatures, and proper moisture levels help the little ones grow faster. In approximately 2 to 3 months, the worm babies should be mature enough to start reproducing. Worms will initiate mating without your direct help. However, you can set the stage by making the worm bin comfy. 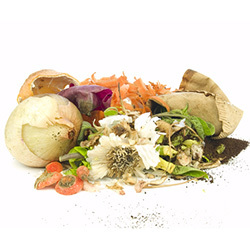 Starting with the bin, choose a tray-based composting bin, make a composting bin, or buy one at a store. A good bin has drainage, air holes, and a lid. Trays will make care and harvesting easier. 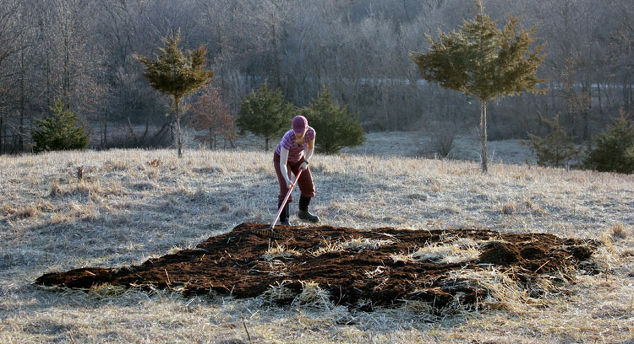 Prepare the bedding, then add Red Composting Worm Mix from Uncle Jim’s Worm Farm. We offer complete instructions on setting up your bin for maximum worm comfort. Feed organic kitchen and garden scraps to the worms. Make sure you feed them only foods that are good for them — see our list of best worm foods. Avoid over-feeding the worms, or your bin might develop problems. See our Worm Bin Troubleshooting Guide if something does not smell right! Under the pleasant conditions you create, the worms will settle in and make new worm babies. The worm population replenishes itself in a well-managed worm bin. Need composting worms or supplies? Check out our online store.